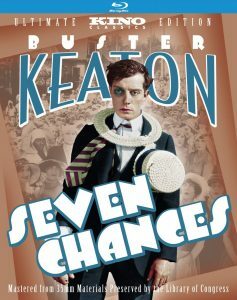 Buster Keaton’s silent film, Seven Chances, in a nutshell, laugh out loud funny — I watched it last night on Turner Classic Movies with some of my children, and we were all laughing loud, long, and repeatedly. The basic story is familiar — Buster must marry by 7:00 p.m. in order to inherit $7 million dollars. When he proposes to the girl that he loves, it sounds like he needs to marry anybody — when in truth she’s the only girl that he loves. “My grandfather left me a lot of money providing I marry some girl today. That silver-tongued rascal. She rejects his proposal, and he’s desperate to marry before the deadline, to save his company from bankruptcy and disgrace. But he’s also completely miserable at the thought of marrying anyone else. Yes, the story’s very familiar — the Three Stooges did it twice, in Brideless Groom and Husband Beware. With all respect to the Stooges, there’s no comparison. Seven Chances is sixty minutes of hilarity, with funny big scenes (Buster running away from hundreds of prospective brides, being chased by boulders) and funny small scenes (the hat check girl, the girls in the barber shop nearly ‘losing their heads’) – it’s seriously one of the funniest movies that I’ve ever seen, and I recommend it highly. Love has never been funnier or more difficult to manage than in the immortal Keaton comedies. Seven Chances is a film often imitated but never rivaled for hilarity and visual virtuosity. Keaton stars as Jimmie Shannon, a romantically jinxed young man who must marry by 7:00 PM to inherit seven million dollars. While fate seems to thwart his efforts to woo the object of his true affection (Ruth Dwyer), public announcement of his strange predicament provides him with a throng of would-be brides who are aggressive in their pursuit of a husband, to say the least. In one of the most rousing, brilliantly choreographed sequences in Keaton’s career, Shannon flees the horde of women while dodging the hostile forces of nature that seem to be conspiring against him (in the form of a colossal rock slide) during his manic dash to the altar.